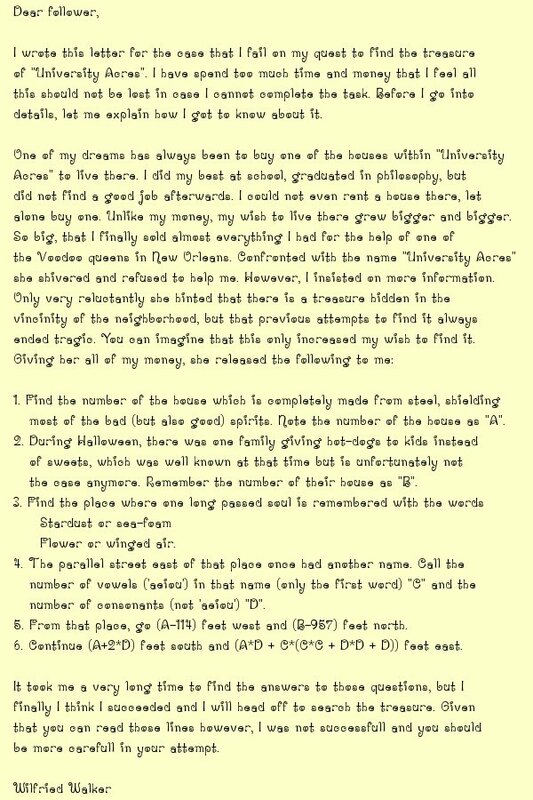 A puzzle about, in and near one of the beautiful neighborhoods of Baton Rouge. A puzzle about, in and near one of the beautiful neighborhoods of Baton Rouge. I would not recommend this for a casual visitor. The posted coordinates are bogus. However, they point to a nice park where you can park and stop for a while and think about one or the other clue. There is probably no hope to find Wilfried Walker anymore. What remains to do for you is to follow the instructions, to find the location of the treasure, and maybe the treasure itself. You can find four hints, near all of the four "gates" of "University Acres". You do not need the hints to solve this puzzle, but they might help. You can check your solution for the final cache with an accuracy of 15 feet.